Throughout fall I have been roasting red peppers and freezing them so that I can enjoy them for the rest of the year and along the way I have not been able to resist using a few of them! I have really been enjoying quinoa since I discovered it and in particular, using it to make simple salads with seasonal ingredients and I figured that a roasted red pepper quinoa salad would be perfect for fall! Keeping things simple is the name of the game and I went with some onions and garlic in addition to the roasted red pepper and quinoa. A salad such as this just cries out for a fresh herb and oregano seemed to fit the bill. Roasted red peppers are an little on the sweet side so some salty feta would fit nicely and some chick peas would bulk up the salad a bit. With that I just needed a dressing and since roasted red peppers and balsamic vinegar go well together a balsamic vinaigrette was the obvious choice. Salads like this one make for great side dishes or even light meals and in fact I have been enjoying the leftovers for breakfasts this week. Speaking of the leftovers, they are nice either warmed up in the microwave or straight from the fridge. Add the roasted red peppers, quinoa, vegetable broth and oregano, season with salt and pepper and bring to a boil. Reduce the heat, cover and simmer until the quinoa is tender and the liquid has been absorbed, about 15 minutes. Remove from heat and mix in the chickpeas, feta and balsamic vinaigrette. So colorful and appetizing! A marvelous salad. My mouth was watering reading that recipe. Really sounds delicious! Great whole grain recipe! Sounds tasty. I love the combination going on in this salad and always looking for new dishes with quinoa! This sounds like such a fresh-flavored salad! Love the mediterranean influence. Hope you enjoy your Halloween Weekend! THANK YOU, KEVIN! Thanks for the freezing method for roasted red peppers!!!! I, too, bought a bunch at a local farmers' market roasted them on the grill all at once then popped into their own little freezer bag. My husband made some Feta and we put that on fresh French bread and top with a piece of roasted red pepper! YUM! beautiful salad! love the colors. it looks so healthy and delicious! I love quinoa– I'm always making salads or soups with quinoa– thanks for the recipe looks yummy!! What great flavours in this tasty quinoa salad!! This looks so delicious. I am going to make it this week! I am new to your blog and love hearing about all your recipes. 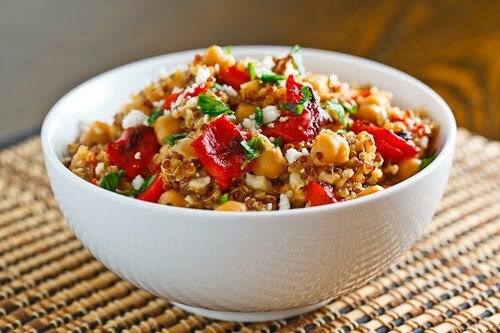 Quinoa, red peppers, and feta…I can already taste it! Oooh this looks good! Love the picture. I love the feta with the quinoa. this looks great -I'm feeling a touch unhealthy, think this would sort me right out! Kevin, have you tried Wheatberries? You can use them as you would quinoa in recipes as well as making it sweet by adding skim milk, a little honey or brown sugar as a breakast. Love your version of this salad, so healthy! Quinoa is one of our favorite grains and I am always looking for new ways to prepare it. Lovely flavors in this salad! Oo, so colorful, so pretty! Love quinoa… can't wait to give it a try! This looks amazing! I'm always looking for new things to do with Quino. I love that you've incorporated chickpeas into the mix. Can't wait to try this out. Thanks for the recipe! Your quinoa salad sure looks good and tasty and seems easy enough to make. I am going to try your recipe. Now this is definitely my kinda salad and I'd definitely make a meal out of it! Love the bright and happy colours too. i would serve this warm out of the skillet, pilaf style. omit the vinigrette and add some roasted pine nuts. I'm attending a vegan pot luck tonight…not my first choice for a dinner, but it's with my best friends so it will be fun. I loved this recipe, but didn't have quinoa and can't use feta for our vegan host. I made it with bulgar, cheese on the side for the rest of us. It is awesome! Can't wait to try it with quinoa. Keep 'em coming Kevin. It's inspiring! I tried this recipe tonight and it was excellent! When I stirred in the feta, I also stirred in fresh cucumbers, tomatoes and Kalmata olives. I was out of onion so I used onion powder. Everyone loved it, even the kids and my husband, who are the pickiest eaters I know. He even suggested I cook it for his next family get together! Courtney Scott: Glad you enjoyed it! I like the addition of the fresh cucumbers, tomatoes and kalamata olives!